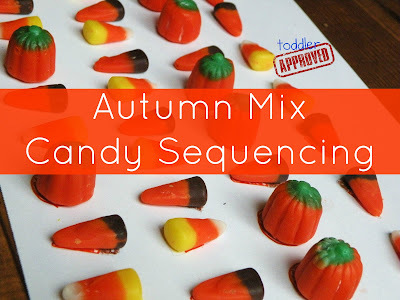 We were going to buy at least one bag of the Autumn Candy Corn/Pumpkin Mix before Halloween, so I thought it would be fun to create an Autumn Candy Mix Sequencing page. First we sorted/separated the Candy Corn, Indian Corn and Candy Pumpkins into 3 separate containers. Next, my daughter matched the appropriate piece of candy to the appropriate graphic. The last row I left blank (purposely) for her to create her own pattern. We've been working on directional and sequencing words (right, left, upside down, before, first, second, next, last, etc) - so this gave us a fun way to practice using them. Wanna play too? You can download the template here. I've also included an additional template that only has the beginning of the sequence - requiring your child to complete and repeat the pattern. For one page you will need 9 Candy Pumpkins, 15 pieces of Candy Corn & 15 pieces of Indian Corn (1 Bag of the Autumn Mix will have plenty). If you are working with a larger group or younger children - I would recommend cutting the page into strips and giving each child only one row to complete. This will be a BIG hit at my house! Thanks! How fun! My kids were just begging me the other day to buy those at the store. I love the idea of making candy educational. haha! This looks like fun! My crew would eat half of the activity before finishing it :) I would love for you to link this up to the AfterSchool party. Looks very fun! Thanks for sharing. My daughter loved doing this last year...can't wait to buy another bag for this year! I featured this post at the AfterSchool party today. Thanks for sharing. Thank you for sharing this at the AfterSchool Party. I featured this post today. love this, but have to say we'd probably eat all the candy right after we were done! @Liz- you and me both!! @Little Wonder Days- thanks for featuring this post!! We loved this sequencing exercise and featured it at our blog, Kindergarten Lesson Plans! We were sure to give photo/idea credit, as well as a link back to your blog, but we'd love for you to check it out! If there are any problems, we'll be sure to take the feature down immediately! I realize it has been a while since this was posted, so the links to the templates are non longer working. Is there any way to still get them? Thanks! I will check into where they went. That is weird! Same here, would love to have this resource, but it says it has been removed from Scribd. If you could email them, I would greatly appreciate that! My email is bottorffj@gmail.com. Thanks so much for this fun and useful resource! Heather email me at toddlerapproved@gmail.com and I can send it to you.